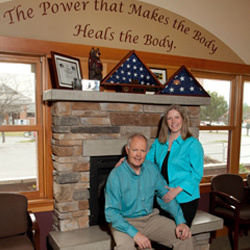 Butler Chiropractic has been fulfilling Missoula’s need for gentle, effective chiropractic care since 1989. We’ve always made family wellness the focus of our chiropractic care center, and over the years we’ve treated an estimated 24,000 patients who have traveled from 22 states and a dozen countries to see us. We’re proud to be able to help family members of every age, from newborns, babies and children, to adults, seniors and pregnant moms-to-be. We also welcome those who’ve been injured at work or have suffered with the after-effects of a car accident. The philosophy of our practice is simple: to provide quality, professional care using gentle, corrective techniques, with an emphasis on education and prevention. We use our hands to adjust you, not gadgets or machines, while respecting the body’s powerful innate healing ability through the removal of spinal misalignment. We treat people as a whole, and strive to help them reach their full potential. It’s our wish to serve humanity by giving people the opportunity to add years to their lives and life to their years. Our passion for our profession has evolved over the decades as we’ve fine-tuned our techniques and refined our approach to help practice members become pain-free and functional. Our goal for each patient is to help them achieve the goals that are important to them. We have decades of hands-on experience in helping patients to regain their health and reduce their pain. Our practice is locally owned and not part of an out-of-state franchise. We don’t answer to any corporation that makes us fit into their mold of quality patient care. We offer a large variety of research-based techniques to fit the unique needs of each patient. 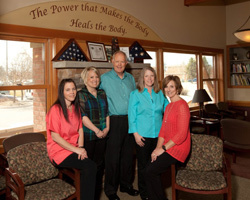 Our staff works as an integrated team in helping you to feel better as quickly as possible. All team members, including our massage therapist, are knowledgeable about your individual examination and X-ray results in order to provide the very best in customized, in-depth treatment. We never hesitate to refer you to another professional if we think we can’t help. We’re honored to have built solid working relationships with many well-respected physical therapists and medical doctors in our community. We live here, we were married here and we have raised our family here. We feel blessed to be your friendly neighborhood chiropractors. Our patients appreciate our attention to detail and our expertise in recommending the right combination of treatment options. We can get you feeling better quickly. Contact our chiropractic office today for a same-day appointment!